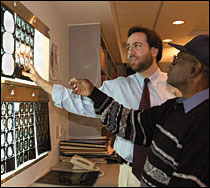 Michael Frankel examines brain scans with a patient. Emory University School of Medicine, in close collaboration with the Marcus Stroke & Neuroscience Center, will be part of a network of 25 regional coordinating centers from across the nation supported by the National Institutes of Health (NIH) to revolutionize stroke clinical research by addressing new discoveries in prevention, treatment and recovery. The NIH Stroke Trials Network, or NIH StrokeNet, has teams of researchers representing every medical specialty needed for stroke care. According to NIH, the new system is intended to streamline stroke research by centralizing approval and review, lessening time and costs of clinical trials, and assembling a comprehensive data sharing system. The regional coordinating centers in the new national network have demonstrated experience in stroke research and recruitment, including the proven ability to enroll underrepresented populations and were required to offer access to the full cadre of specialties involved in stroke care. "We are the only funded site in Georgia. The Georgia StrokeNet is a close collaboration of community providers, clinical investigators, departments and institutions," says Michael Frankel, MD, professor of neurology, Emory University School of Medicine, chief of neurology and director of the Marcus Stroke and Neuroscience Center for the Grady Health System, and principal investigator for the Georgia StrokeNet. "The new project builds on our strengths in the areas of stroke treatment, prevention and rehabilitation, and the existing collaboration we established throughout the state through many successful projects like the GA Coverdell Stroke Registry and the Marcus Stroke & Neuroscience Center," says Frankel. David Wright, MD, associate professor of emergency medicine, and Steven Wolf, PhD, professor of rehabilitation medicine, both at Emory School of Medicine and recognized as leading experts in the field, will serve as Frankel’s senior co-principal investigators on the Georgia StrokeNet. NIH will fund and manage the 25 centers, which are strategically placed in every region of the country. Each center will receive five-year funding, with $250,000 per year over the first three years, and additional funds driven by the completion of milestones. NIH has a strong history of successful stroke clinical trials over the past 40 years, leading to groundbreaking advances in treatment and prevention of the disease, including the first proven treatment for acute stroke (t-PA) in which Grady and Emory played a major role leading to FDA approval and a new standard of care across the US. "Stroke is a devastating disease and a major public health burden in the US," says Frankel, who adds, "This is particularly true in Georgia, which is situated in the heart of the stroke belt, an area that has more strokes and stroke-related death than other areas in the US." To reduce this burden, the Georgia StrokeNet will conduct clinical trials for patients with acute stroke, people at risk for recurrent stroke, and individuals recovering from stroke with the aim of promoting and accelerating discovery of effective treatments for use in clinical practice. "We need to have a balance of approaches to decrease the high burden of illness due to stroke," says Frankel. Every 40 seconds, someone in the United States has a stroke. It occurs when the blood supply to part of the brain is blocked or when a blood vessel in the brain bursts. In either case, parts of the brain become damaged or die within minutes. Stroke is the third leading cause of death in the Southeast and the leading cause of serious long term disability in adults. The number of new strokes reported each year is 795,000, making stroke the fourth leading cause of death in the US. Because stroke is age-linked the incidence is expected to rise rapidly in the next decade.